Obituary for Bradley R. Rodman | Peterson Kraemer Funeral Homes & Crematory Inc.
Bradley R. Rodman, 42, Wausau, formerly of Edgar, died Tuesday, January 22, 2019 at North Central Health Care Center, Wausau, due to Myotonic Muscular Dystrophy. He was born January 28, 1976 in Medford, son of Judy E. (Becker) Ulrick, Weston and the late Robert G. Rodman. As a young man Bradley helped out his parents on their family farm in the town of Frankfort. He took great pride in being in charge of the calves. After they left the farm he went to work at the Korner Kitchen for over two years then moved to Wausau and lived at Opportunity Inc. on Sherman Street in Wausau. 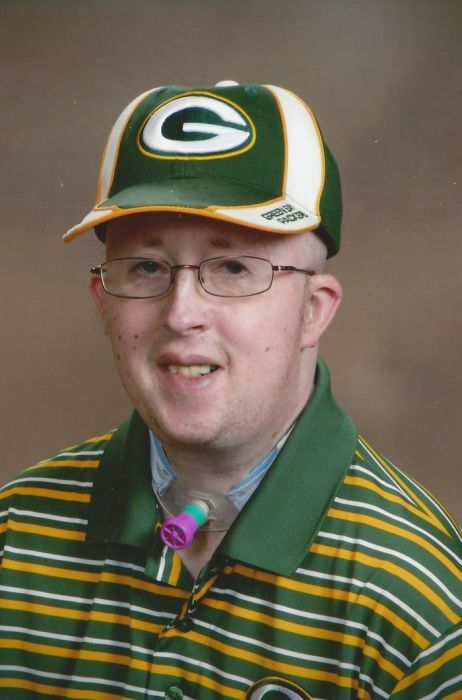 Bradley was an avid fan of the Green Bay Packers, Brewers and the Wisconsin Badgers. He also enjoyed watching WWE wrestling and cherished the time he spent with his family. Survivors include his mother and step father, Judy (Jim) Ulrick, Weston, his brothers, Brian (Cindy) Rodman and Blain (Diane) Rodman, both of Wausau, his step sister, Julie Ulrick, Mosinee, four nephews, Nathan, Joshua, Thomas and Robert Rodman, four aunts, Jean (Wayne) Brown, Jane (Daniel) Schaefer, Martha Rodman, and Sue Becker. Besides his grandparents and his father he was preceded in death by two uncles Lyle Becker and Gene Rodman.